The Atlantic Council launched a survey of NATO’s defense budgets and the recently announced reductions across the Alliance. 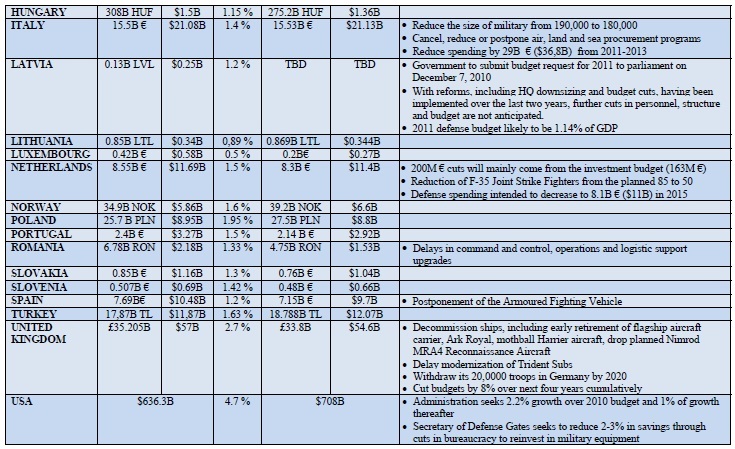 The data below reflects the savings being attained through reductions in personnel, operating budgets and procurements. The latter includes cancellations, postponements and reductions of purchase of hardware and services. Click here to download a PDF version of the charts. Most of this data is from publicly available sources, such as the official websites of the Ministries of Defense, newspaper articles and various defense spending analyses. 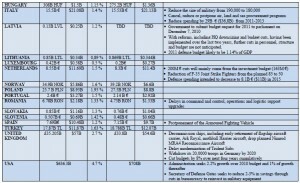 Figures for 2011 reflect approved, proposed and projected defense budgets. In most cases, the data was confirmed with the respective governments, in order to convey the most accurate information. This data was compiled by Simona Kordošová, International Security Program, Atlantic Council. This article is part of a New Atlanticist discussion – The 2010 Lisbon Summit: A New Atlanticist Forum – on the Summit’s expectations, areas of focus, and potential outcomes.